Salt, Jenna’s first full collection of poetry, was largely composed during or after her frequent trips to the Devon coast, with her favourite beach taking the starring role. “One of the poems is actually called Salt, but I felt the title was apt for the whole collection,” explains Jenna. The poems themselves are also deceptively simple; in one sense they are snapshots from the seaside, creating a vivid picture in the mind’s eye and inviting the reader to share the poet’s delight in the coastal landscape, but they are also subtly metaphorical and – like Jenna’s previous work – deeply reflective. Salt contains 56 poems, covering the changing faces of the sea from balmy summer to treacherous storms and fog. Anyone can appreciate an attractive view, but Jenna’s carefully-chosen words describe the intensity of the experience, teasing out the details others might miss and suggesting new ways to look at simple things like the sun and sky. The sea, anthropomorphised by metaphor and simile, becomes a living character capable of serenity, joy and rage. Jenna claims the main theme running through the book is “the world is a wonderful place”, though not all the poems are immediately uplifting. 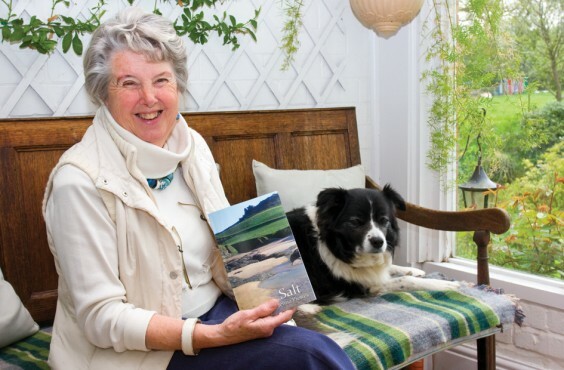 “My husband and I go down to Devon every month, and I love walking Misty [their friendly collie] through the valley down to the beach,” says Jenna, who has written poetry throughout her life but is able to devote more attention to it since retirement. She always keeps a notebook with her to jot down thoughts and phrases as they come into her head, and says that some poems come quickly, almost fully formed, while others might take two or three months and go through several re-writes. Salt is published by Indigo Dreams, which produces poetry magazines and accepts submissions twice yearly. Jenna has had poems published in these during the past few years, and when she submitted the idea for a whole collection, the firm said it would be delighted to publish it. Jenna describes the process of writing the book as “great fun”, and is already planning a sequel, subject to the success of Salt. The next collection is based on impressions of exotic places she has visited. Meanwhile, one of her poems is keeping good company in another collection published by Indigo Dreams: Heart Shoots, sold in aid of Macmillan Cancer Support, also contains words by the likes of Benjamin Zephaniah, TS Eliot, Seamus Heaney, Bob Dylan and Leonard Cohen. Salt is due to be launched at an independent bookshop in Kingsbridge, the nearest town to the Devon beach, on July 6. It will then be on sale from the publisher (http://www.indigodreams.co.uk), from Jenna herself (call 0121 445 1624) and on Amazon, priced £7.99. The publication will also be celebrated with a music and poetry evening on July 13 at St John’s Church in Bromsgrove. Jenna and others will read some of her poems, interspersed with suitable music from local performers who play for Birmingham Philharmonic and the CBSO Youth Orchestra. When she’s not writing poetry, Jenna can usually be found hard at work in the garden at Selvas Cottage, where she has lived for the best part of 30 years. The garden also opens on the first Thursday each month (until October) as part of the Quiet Garden Trust, in which small groups of people can come and spend the day relaxing, contemplating or meditating in the peace and seclusion. “We’ve been part of this since 2002, and it’s a lovely way to share our garden with others,” says Jenna. Here’s a sneak preview of three of the poems from Salt, including the title work. . .
fleeing the war of water and wind. as she runs laughing up the beach.